Become a master in solving Slitherlink. You will experience Slitherlink 15x15, Slitherlink 20x20 and Slitherlink 25x25. You get the perfect mix of different sizes of Slitherlink to keep you entertained for weeks. After solving all the puzzles in this book, you will be a Slitherlink Pro. 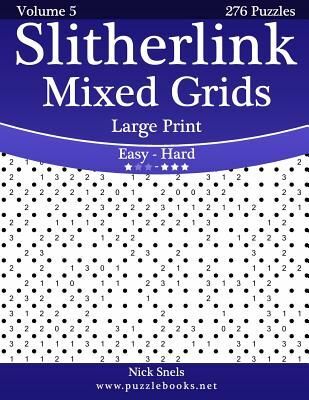 You start with easy Slitherlink puzzles, which keep getting bigger and bigger and you gradually build your way up to extremely hard Slitherlink puzzles. Once you pick up this book, you won't be able to put it back down. You have been warned! The goal of Slitherlink is to connect horizontally and vertically adjacent dots so that the lines form one single loop with no loose ends. In addition, the number inside a square represents how many of its four sides are segments in the loop. Dotted squares without a number can have any number of loop sides. I guarantee that every logic puzzle in this Slitherlink puzzle book has been carefully checked to ensure that each puzzle has only 1 solution. Slitherlink is also known as Fences, Loop the Loop, Dotty Dilemma, Sli-Lin, Great Wall of China, Takegaki, Loopy, Ouroboros, Suriza and Slither Link.